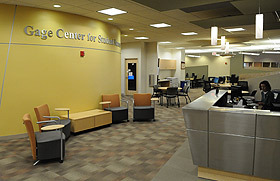 On February 6, the academic advising staff will also relocate to the Gage Center. Their offices will be located in room 227, adjacent to the computer area (former home of the Admission Possible coaches). All students should check in at the reception desk for appointments with any of these staff members. In addition, students who are using the Groves accommodations lab (for testing) and students who are serving as test proctors or notetakers through the CLASS office should also check in at the desk. Reception desk hours are 8 a.m. - 5 p.m. Monday-Thursday and 8 a.m. - 4 p.m. Friday. Meeting rooms are reserved during business hours for staff use. Rooms are available in the evenings and on weekends for individual and group studying or meetings. Computers in the Groves Center are available for student use during regular library hours.